The New England Patriots visit the Atlanta Falcons in Week 7 of the 2017 NFL season. PFF previews the top player matchups of the game. QB Tom Brady vs. S Ricardo Allen – Brady’s excellence doesn’t seem subject to the grind of time. He is not only once again PFF’s top-graded quarterback on the season with a mark of 92.0, but he has shown few weaknesses on a week by week basis. Other than a middling effort in Week 1 against the Chiefs, he hasn’t had a game grade below 83.4, each week grading as “good” to “elite” on the PFF scale. He is the only quarterback with an elite grade on the season. He has even increased his deep passing this year (third ranked in deep passer rating), but Ricardo Allen presents a threat this week. He’s played 143 of his 180 coverage snaps as a deep free safety, and has yielded a passer rating of 39.6 when playing deep this year. However, interestingly enough, no quarterback has targeted him to this point when he’s been in deep coverage. 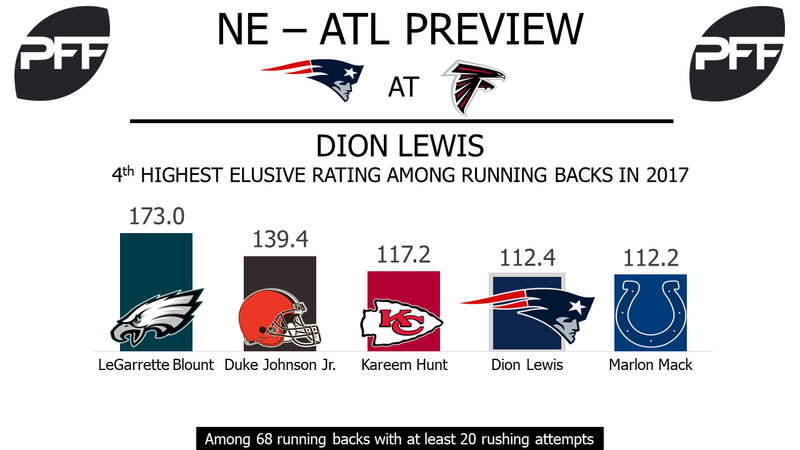 RB Dion Lewis vs. LB Deion Jones – Jones comes into this matchup with a strong overall grade of 85.1, good for seventh among qualifying linebackers. He’s been good at making his tackles in the run game as well, with only one missed tackle in 23 attempts against the run. Lewis might challenge him in that department however. Lewis, on only 30 rushing attempts, has forced 11 tackles and has a total elusiveness rating of 112.4 on the season. WR Danny Amendola vs. CB Brian Poole – Amendola has been his usual solid self so far this season. His 77.0 overall grade ranks 31st among qualifying receivers, and he’s been Brady’s go-to target out of the slot. When lined up in the slot, Amendola has a yards per route run mark of 2.37, good for fifth among qualifying slot receivers. He’ll be seeing a lot of Brian Poole this game, as Poole is the primary slot coverage man for the Falcons. He has been one of the bigger liabilities in the slot however, as his 1.43 yards per cover snap in the slot ranks as the sixth-highest mark among qualified slot cornerbacks. 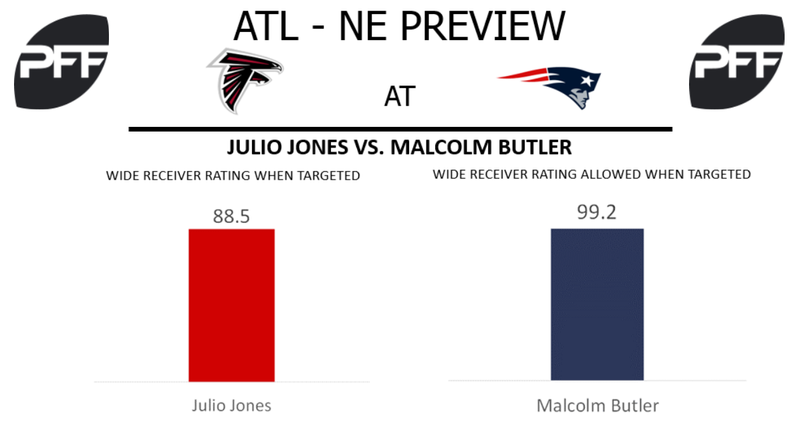 WR Julio Jones vs. CB Malcolm Butler – The Patriots secondary comes into this Super Bowl 51 rematch a bit shorthanded as cornerbacks Stephon Gilmore and Eric Rowe are banged up and could end up missing this week’s matchup. If neither of them are active, that would leave fellow cornerback Malcolm Butler as the Patriots top cornerback and most likely candidate to shadow Falcons’ wide receiver Julio Jones. Butler has been one of highest graded cornerbacks over the past two seasons, but his overall grade of 79.2 is a bit lower than his 2016 grade of 88.1. Jones presents an enormous challenge for Butler this week and it figures to be one of the key matchups in determining the outcome of this game. Despite a lower-than-expected target total through five games this season, Jones has still graded as the second overall receiver with a grade of 86.7. RB Devonta Freeman vs. LB Elandon Roberts – The Falcons often rely on their running game to keep defenses honest and running back Devonta Freeman has been one of the most elusive half backs in the NFL. Through five games, Freeman has forced 20 total missed tackles, which is good for the seventh best elusive rating of 61.3 out of 48 qualified half backs. In order to slow down Freeman, the Patriots will look to linebacker Elandon Roberts to be a force in the running game. Roberts has been a productive run stopper for the Patriots defense, as he ranks 11th among inside linebackers with a run-stop percentage of 10.2 percent. T Jake Matthews vs. Edge Trey Flowers – One way the Patriots can slow down the Falcons prolific offense is by generating a pass-rush against the Falcons offensive line. Falcons left tackle Jake Matthews will be responsible for helping to slow down the Patriots pass-rush. Matthews has been up and down a bit this season in pass blocking and has earned a pass-blocking efficiency rating of 94.4, which ranks 34th out of 60 qualified offensive tackles. Edge defender Trey Flowers has been one of the better pass-rushers for the Patriots so far this season. The third-year player out of Arkansas has earned the highest overall grade among Patriots’ edge defenders with a grade of 79.1.